Is that a white carrot? No it’s a parsnip! In this Ultimate Guide to Parsnips, we will get to the bottom of several common questions about this tasty root. Where do parsnip seeds come from? Can you freeze parsnips? How about eat parsnip leaves? What is healthy about parsnips? Get answers and recipes below. Where do parsnip seeds come from? Parsnips root vegetables from the Apiaceae family which also includes carrots, celery, parsley, angelica and Queen Ann’d Lace. Parsnips do most of their growing underground. However, as they mature, they sprout tall, yellow flowers. They’re biennials so, in their second year planting they’ll produce seeds. The make yellow flowers which have papery seeds in them. What is a wild parsnip and is it the same as the parsnip we eat? Wild Parsnip is an invasive species, that is related to cultivated parsnips. They’re not the same though! If you’ve been to the northern part of the US or Canada in the summer, then you have likely seen them on the side of the road in meadows and fields. They can even survive as far south as Louisiana.They look like tall very robust Queen Anne’s Lace but their flowers are chartreuse green as opposed to white. Wild Parsnip is thought to be native to Eurasia, and may be a mutation of a variety of cultivated parsnip. While the roots of wild parsnip are technically edible, their greens are toxic upon contact with human skin and cause burning and rashes, especially when exposed to sunlight. One concern about Wild Parsnips is that it grows in dense stands that outcompete native plants when left unchecked. The average lifespan for a wild parsnip plant is about two years. Cultivated parsnips, or those that we eat are different from wild parsnips. Even cultivated parsnips require gloves when handling the foliage, as handling the greens can cause allergic reactions. When are parsnips in season? When should you harvest parsnips? This hardy root is unique in that the colder the temperature, the sweeter and nutty its flavor becomes. Parsnips prefer the cold, which makes their season the late fall through late spring, depending on the region. They can even withstand being frozen. Here in Vermont, chefs actually seek out spring-dug parsnips because they are so sweet! This cream colored veg is slow to grow, and can take up to 130 days to mature. Patience is a virtue, especially when it means having fresh produce all winter long. Parsnips, as with many root vegetables are great storing-crops. They have a low water content, and once the greens are removed can be kept in a cool dry place (like a root cellar) for months. Freezing parsnips is a great way to preserve them for long term storage. The texture of the parsnips will be changed once they are frozen and thawed however. Use thawed parsnips for mashed parsnips or in soups and stews. Frozen parsnips cannot be roasted. To freeze parsnips, peel and cut them into desired shapes. Blanch for 1 minute in lightly salted water. Shock in ice water, and drain well. Try to remove as much moisture from the outside of them by laying them out on a clean towel. Freeze them in a single layer on a sheet pan. Then transfer the frozen parsnips to a re-sealable freezer bag. What is the best way to prepare parsnips? Parsnip skin is not only slightly bitter, but is a little tough as well, so parsnips must be peeled. Occasionally, when parsnips are very mature the central core can also become fibrous, and can be cut out if desired. But usually that is not necessary. The best and easiest way to prepare parsnips is to roast them. Roasting brings out their natural sugars. You can even cut them into “strips” to make oven fries! They are also wonderful when steamed and mashed as in the classic Irish side dish, Green White and Gold. I also like to mash them with potatoes, add them to gratins or just steam them and toss them with butter and herbs! Parsnips are great in soups just like their relative the carrot. We also enjoy them cut into larger chunks and added to stews and braises. Can you eat parsnip leaves? Do not eat parsnip leaves. If they can burn your skin, you sure wouldn’t want to put it in your body, right? Yes parsnips can go bad. When they start to get brown mushy or slimy soft spots on the skin and around the top, throw them in the compost. How do you cut a parsnip? When I roast parsnips or braise them in a stew, I like to cut them with an oblique cut. See above. An oblique cut is a great way to yield relatively evenly sized pieces from heavily tapered parsnips. Meaning ones that are really fat at the top and skinny at the bottom. You can also cut them just as you would a carrot. Besides removing the core (mentioned above) there is nothing different from working with carrots. Like many vegetables and root vegetables, parsnips are a powerhouse of fiber. Each ½ serving contains nearly 4 grams, or 15%, of your recommended daily fiber needs. Parsnips are a starchy vegetable, so they contain slightly more calories than non-starchy vegetables. For this reason, they make for a great side or hearty vegetable base to go with a meal. Parsnips are a great source of vitamin C to help you fend off cold and flu season. This tasty root is a great addition to a health-promoting diet that contains a variety of vegetables. For those of you who are not familiar, a low FODMAP diet is commonly used to identify food sensitivity and to manage the symptoms of irritable bowel syndrome. “FODMAP” stands for fermentable oligosaccharides, disaccharides, monosaccharides and polyols. Foods that contain high amounts of FODMAPs can be poorly digested in people with gut disorders. Luckily, parsnips are low FODMAP and typically easy to digest by all! Try using them as a low FODMAP alternative to mashed potatoes. When should I introduce parsnip to my baby? Once a baby is over six months old, it is safe and encouraged to start introducing them to solid foods. Mashed fruits and vegetables are a great place to start. It is perfectly safe and healthy for you baby to try parsnips when they are seven months old. Remember, it may take up to 15 exposures to a food for your little one to realize they enjoy the taste! Don’t get discouraged or defensive if they don’t like a food right away. Simply keep offering and see what happens. The best way to feed your child well is to offer a variety of health-promoting options. Why are parsnips sometimes bitter? As mentioned before, experiencing cold temperatures or a frost gives parsnips a sweet and nutty taste. Conversely, parsnips grown in warm temperatures can become bitterer, similar to arugula or other greens. If the bitter taste is off-putting to you, try buying or eating parsnip in the winter months and avoiding early or late season parsnips. Oh, what an interesting and informative post! I didn’t know you could have a reaction to parsnip greens – you learn something new every day! Those roast parsnips look absolutely perfect too. This is such an interesting guide!! Thank you so much for sharing! Thank you so much for sharing this! I’ve yet to use parsnips, but always wanted to and these are great ideas! 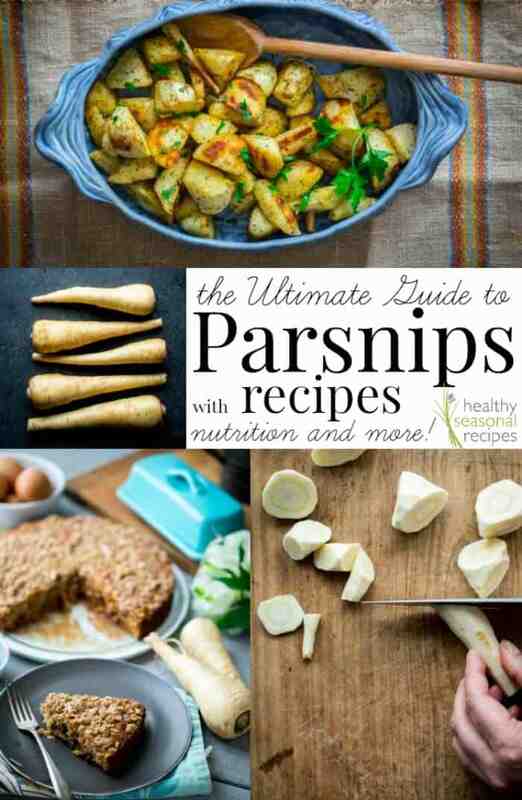 I love this guide to parsnip. I think that it is really underappreciated vegetable.